More than 300 athletes will hit the gridiron at the 2018 State Flag Football Tournament on Saturday, Nov. 10, at Tates Creek High School in Lexington. It is the first time Tates Creek has hosted the State Tournament. Games will get underway beginning at 9 am. To qualify for the State Tournament, teams must compete in at least one Regional Tournament, which will be held in October. 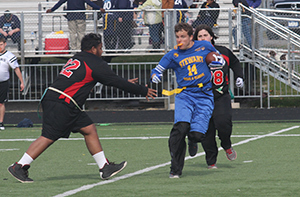 Flag football is the newest team sport in the Special Olympics Kentucky program. It was first offered in 2010 and was instantly very popular throughout the state. For several years the State Tournament was part of the State Summer Games lineup; however, last year flag football moved to the more traditional fall season and became a stand alone event for the first time. For more information about the SOKY Flag Football Program or to volunteer for one of the Regionals or the State Games, please contact Hunter Brislin at (800) 633-7403 or hbrislin@soky.org.